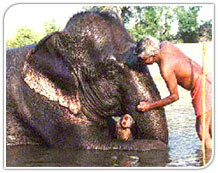 South India Wildlife, South India Jungles, Jungle Tours India, India Jungle Travel, India Jungles, India Jungle Tourism, Jungle Tour India, Jungles India, Indian Jungle, India Jungles, Indian JungWle. South of the Vindhyas, the southern states of Andhra Pradesh, Tamil Nadu, Karnataka and Kerala are all noted for their fine wildlife sanctuaries. The forests in South India survive mainly along the Western Ghats - a range of fairly high hills that run parallel to the west coast. A cluster of protected areas that lie adjacent to one another in the states of Karnataka, Tamil Nadu and Kerala, form a large conservation area in the Western Ghats - the Nilgiri Biosphere Reserve. In Andhra Pradesh, located in the arid interior of the ancient Deccan Plateau, are pockets of dry deciduous forests. The largest Tiger Reserve in the country is to be found here.